The Snohomish County Music Project is using music as a tool to strengthen the Tulalip and Marysville community. 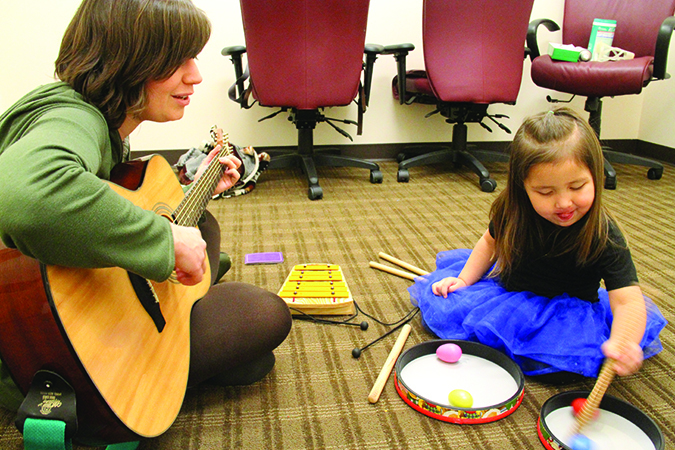 With over fifteen programs, the Music Project has dedicated their time to improving the mental well being of Snohomish County community members through music therapy. 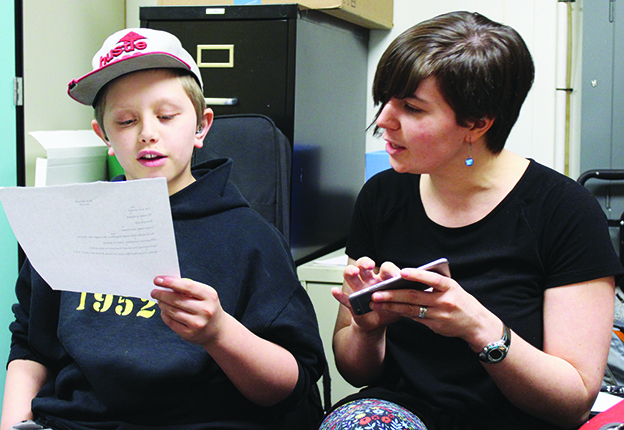 The Marysville School District originally reached out to the Snohomish County Music project when looking for alternative therapy for children who have experienced trauma in their young lives. Music Therapy is now offered to many schools in the Marysville School District including, Marysville-Pilchuck, Quil Ceda Elementary, and Marysville Arts and Technology. Quil Ceda Elementary student, Oliver walked into a spare room of his school’s library wearing a visibly huge smile. As he took his seat, Music Therapist Victoria Fansler handed him a stack of cards. Each card displayed a cartoon making facial expressions with the corresponding emotion (i.e. happy or sad) written in text beneath the cartoon face. As his instructor retrieved her guitar from its case, Oliver examined the cards. Once he picked two cards out of the deck, Victoria began strumming her guitar to an interactive welcoming song between teacher and student, pausing only for Oliver to respond to questions within Victoria’s lyrics. When her song reached the question ‘how are you feeling today?’ he revealed the cards he had chosen, excited, because he was in Music Therapy class and upset because his aunt postponed her visit with him until the weekend. This warm-up exercise allows the student to express their emotions and presents them with the opportunity to explain why they are feeling those emotions. Victoria begins each of her sessions with this exercise as the majority of her students from the Marysville and Tulalip community happily sing along. At the end of each session she remixes the welcome song to recap the session and say ‘goodbye until next week’. 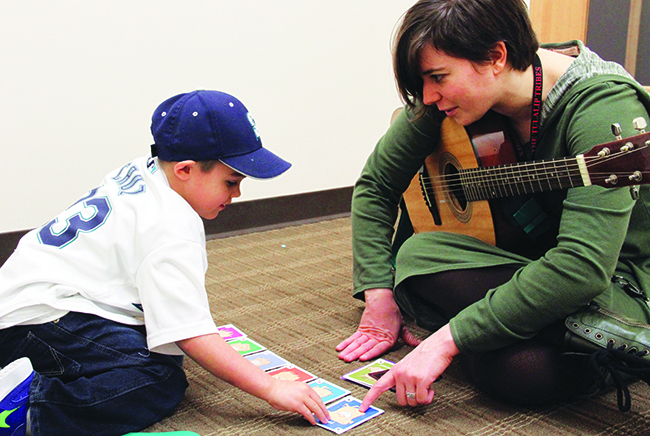 Tulalip Cares Charitable Contributions recently funded Victoria’s music therapy program through the Snohomish County Music Project. She is currently working full time in the Tulalip-Marysville community helping students work through traumatic life events by using music as an instrument of healing. Countless studies have shown that music therapy has assisted many victims of trauma. While focusing on music individuals are able to relax, therefore reducing stress and anxiety levels. Music therapy provides an outlet for individuals to express their emotions creatively. Victoria also provides services to the Betty J. Taylor Early Learning Academy once a week and works primarily with students who are currently, or have previously been, involved with Child Protective Services or beda?chelh. In cases of neglect, children are sometimes unaware of social cues, such as facial expressions and vocal tones. For this reason, Victoria incorporates mirroring into her lesson plans, to help the children at the academy recognize emotions that others display. In elementary schools, Victoria teaches the children how to express their emotions through music. Oliver, for example, is a huge Eminem fan. In his individual session Oliver wrote down and illustrated everything that makes him feel safe as well as his fears. While working on the assignment a Bluetooth speaker played a cover, performed by kid YouTube sensation Sparsh Shah, of Eminem’s ‘Not Afraid’. Oliver is familiar with the Eminem song and because of the tools music therapy has provided him, he was able to write his own lyrics to the track. Oliver said that those particular lyrics that he wrote are in memory of his little brother who passed away when they were both at a young age. Aside from her acoustic guitar, Victoria uses a variety of instruments in her sessions including a melodica. The free-reed instrument is essentially a keyboard that requires users to blow air into it for sound output, much like a wind instrument. “A lot of people suggest meditation and focused breathing for children with trauma, but I found that sometimes it can be hard trying to convince kids that sitting still and breathing quietly will help them feel better. The Melodica is really engaging, if you hold a long exhale breath it makes a really pleasant sound that lets you explore the keys and get creative while playing it. This helps build self-awareness so the kids can feel comfortable self-expressing musically and recognizing what tools they already have within themselves,” Victoria states. The Snohomish Music Project offers a variety of programs countywide including music therapy services for infants, children, teens, Veterans suffering with posttraumatic stress disorder, as well as senior citizens suffering with memory-related illnesses. The non-profit’s headquarters is located at the Everett Mall and hosts live music performances weekly. Since 2010 the Snohomish County Project, previously known as the Everett Symphony, has refocused their time and energy to help heal and strengthen communities. “Rather than using music as tool to provide performances, we have transformed and provide a way to use music as a tool to help community members thrive and to help make impactful changes in the community. We are able to help individuals better themselves and they in turn become positive contributors to our community,” states Snohomish County Music Project Director, Vasheti Quiros. Victoria is making a positive impact in the community through music therapy and because of its popularity and high demand, (she has over twenty kids on a waiting list at the early learning academy) Victoria hopes to expand her program and open services to the entire Tulalip community. She currently is in talks with Youth Services about hiring youth of the community, with hopes of training them to become music therapists. This entry was posted in Health, Local News, Tulalip News and tagged healing, MARYSVILLE, Music Therapy, Tulalip, Tulalip Tribes by Kim Kalliber. Bookmark the permalink.